Most anglers, myself included, struggle with making a spey cast off their non-dominant side. As a right-handed caster, it has always felt unnatural for me to cast off my left shoulder. It’s almost the two-handed equivalent of casting left handed. Because it feels awkward, I’ve never gotten quite as much distance off my left shoulder. I was fishing with guide Barrett Ames, on the Deschutes, recently when he mentioned that his off shoulder cast was his strongest. This peaked my curiosity so I asked for some details. Barrett’s answer was so simple, it made me realize that the problem, like so many, was in my head and not my hands. If this doesn’t immediately make sense to you, pick up a spey rod, or a broom stick for that matter, and walk yourself through it. You’ll see quickly that when you make a cast off your dominate shoulder your bottom hand, which provides the power for the casting stroke, crosses your body, which limits its range of motion. When you cast off of your non-dominant shoulder, your bottom hand lines up perfectly with the elbow and the shoulder, making for a nice full range of motion. 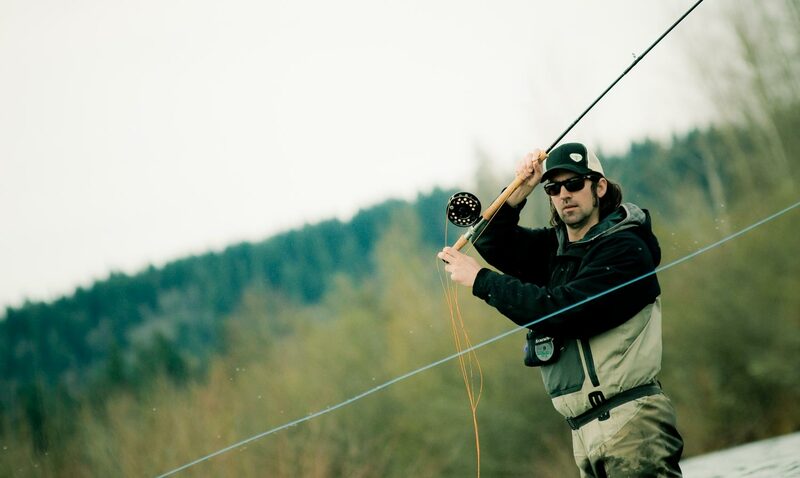 The rod naturally falls in very straight plane, which helps your cast land straight. This simple piece of information made me realize that what I was doing was thinking about the wrong things. Instead of focusing on how unnatural it felt to cross my body with the top hand I started to focus on how natural the casting stroke felt for my bottom hand. Bingo! My cast came online. There’s a lot to be said for looking at the positive. If you’re struggling with your off shoulder cast, try changing your mind. Your cast may follow. This entry was posted in Fly Casting, Spey Casting and tagged fishing, fly casting, Fly Fishing, fly fishing lessons, Fly Fishing Photography, fly rod grip, Gink and Gasoline, how to fly fish, Jeff Hickman, Kent Klewein, learn to fly fish, Louis Cahill, photography, spey casting, spey rod, switch casting, switch rod by Louis Cahill. Bookmark the permalink. I am probably biased bc Jeff and Barrett (mentioned above) taught me how to effectively spey cast. I might add that they are the best instructors I know of- and they have a little different technique than the mainstream, youtube vids etc. If you dont think paying up for a guide is worth it… I will gladly fish behind you in the run 🙂 The technique i learned from them is adaptable- casting competitions are on a dock, fish are caught sometimes with water at one’s armpits. All of that said, this cast I have so very much to comment about. Not only do I practice it very often, it is exceptionally useful for catching fish. It changed my skill set overnight. First off, the most obvious, i need to cast off my lefts side nearly 50% of the time (consider wind, river right, tree on my right etc). Also I kayak fish (standup), which requires more than one direction of anchor placement. I have used this cast from a boat swinging for brown trout- hey not everybody gets the good seat. Secondly, when it is late in the day and I start to see some of my casts under perform and I see myself falling out of the groove…It is very handy to switch sides and give the mental muscle memory a break. Cast a few cack hands/off shoulder bombs, then go back to right side, and suddenly I am in the groove again. Two or three guys on a recent trip tried this- they can vouch for its odd credibility. Heck, even athletes need to get out of a mental rut. How do many of them do it? Switch up the technique, get into a groove. This has helped me immensely to make the 1000 casts to catch a steehead. Further, I know purists say left hand on top ect. But many times when I am fishing “time” is important. For example, when I spey or skagit for carp or other species I need to make a quick cast off of the my left side (off shoulder etal). When you see a carp roll… you dont want to take the 15 seconds to switch hands. I will add you can snake roll, single spey, poke etc. The other problem with my left hand on top…I cant reel with my right hand- why get tangled up on a hook up when it is unnecessary? Lastly, I have made some good long casts; but when using skagit with T-11 + or any other FIST line/integrated sinking line… this cast can really line it up for the distance (as stated above). Using one of Barrett’s T&T rods, and nextcast line (integrated sinking) with T-14, I was bombing some of the longest laser beams i have ever bombed…Those lines sink VERY fast and require a fast sweep and accurate anchor placement. The cack hand, off shoulder actually makes some of the longest casts for me- especially with when I need to fishing deep. Sorry for the long post, but this really changed my game. As someone whos home waters are river right, making a trip to a river left situation was daunting. Dozens of miserable double speys and snap t’s didn’t make for a good start to the morning, but I adapted. And as the day went on, I was throwing better than I normally do over my right shoulder. Wasn’t sure what happened or why, but I lost my apprehension about the off shoulder cast that morning, and look forward to more of it in the future.